A man of few words, Poppa uttered this phrase every time Momma served him a 3-egg omelet with toast and home fries. Comes with one filling. 8.49. Additional fillings extra. For an egg white only omelet add 1.00. Bucky’s griddle sizzled as the family had their three scratch batter buttermilk pancakes. Served with real maple syrup. 7.49 Add pecans, strawberries, bananas, blueberries, or chocolate chips for 1.49 each. As kids we could scarcely wait to open our very own box lunches. We giggled in delight as we opened the best lunchtime surprise package ever. Real roast turkey breast, stuffing, whole berry cranberry sauce, and mayo on a homemade Sally Lunn roll. Roasted real turkey breast. Choose your bread and toppings. Thin-sliced medium-rare roast beef and sharp provolone with horseradish mayo, lettuce, and tomato on a Sally Lunn roll. Applewood smoked bacon, sliced tomato, lettuce, and mayo on toasted country white bread. Thin-sliced Virginia ham with Jarlsberg swiss, whole grain dijon mustard, lettuce, and tomato on multigrain bread. Paper thin slices of distinctively salty Smithfield country ham pairs perfectly with sharp cheddar, lettuce, and mayo on a Sally Lunn roll. Homemade pimento cheese spread with house-smoked Virginia ham and sliced cucumbers on sourdough bread. 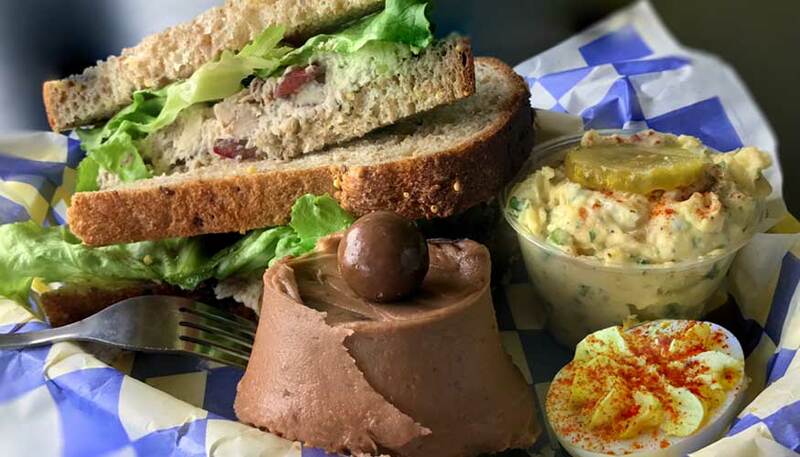 Our famous chicken salad with pecans and grapes served on multigrain bread with lettuce. Our best seller! Avocado, cucumber, sunflower seeds, colby jack cheese, lettuce, tomato, and chili mayo on multigrain. Homemade egg salad with lettuce and tomato on country white bread. White albacore tuna salad with lettuce and tomato on country white bread. Grilled cheese comes with tomato soup, all other items come with one side. For french fries or sweet potato fries as your side add 1.00. 4.49. Add a 3-cheese grilled cheese sandwich for 4.50. We also have more soups that we make when the weather gets colder. Give us a call to find out which soups we are offering today. Each item comes with one side. For french fries or sweet potato fries as your side add 1.00. Each item comes with one side. For french fries or sweet potato fries add 1.00. = Is gluten friendly or can be prepared gluten friendly by omitting bread, Upcake, or croutons.